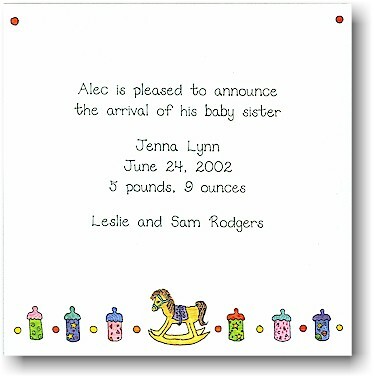 White square card with rocking horse and baby bottles along the bottom. Upper corners have red dots in them. Due to its square size, additional postage is required to mail this card. White flat square card with baby bottles in lower corners and red dots in upper corners. Multi-colored dots along the bottom. Due to its square size, additional postage is required to mail this card.